My friend Heather and I were talking over the weekend about the expense involved in buying throw pillows. I mean, a cute throw pillow can run you 40-60$ and that is at Pier One. Don't even get me started on other places! 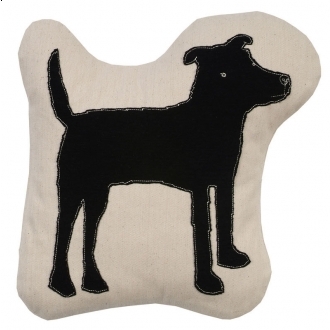 For example, I'm digging on this dog pillow but the dude runs about $110. No thanks..
Well, so with my new best friend website Polyvore, I took some cute pillow options from Wal-Mart and Target and created a mood-board-thingy for you all to see that pillows CAN be cute and cheap! I was all about the dog pillow...until I saw the price tag!!! But I love the Target options...I can't wait til we can move and redecorate in ATL! (First thing we're getting after we move- a bigger couch, with cute throw pillows).